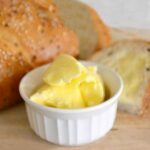 It takes just minutes to whip up this batch of homemade butter (& buttermilk) in your stand mixer! (OPTIONAL) Peel & finely grate a carrot. Heat in small saucepan with 1/4 cup milk until milk is bubbly. Use a clean cheesecloth to strain orange-colored milk into the bowl of your stand mixer. Discard shredded carrot. Pour cream into bowl of stand mixer fitted with paddle attachment. Add salt. Cover mixer with a towel–trust me on this one, it will be messy! Turn mixer on high. Continue mixing, checking on mixture frequently. It will first turn to whipped cream, then begin to get grainy and separate into butter and buttermilk, and the splashing will get much worse. The butter is ready when it sticks in a clump to the paddle. Place a colander over a bowl, then strain the buttermilk off of the butter. Using your hands or a spatula, press out excess buttermilk under cold running water until water runs clear. Shape into stick or ball. Serve with bread and enjoy! Preparation time: 30 minutes. Number of servings (yield): Approximately 1 pound of butter + 2 1/2 cups of buttermilk. Butter will keep covered in refrigerator for up to 4 weeks.